Homelessness is not discussed as much as it needs to be, especially as it relates to marginalized groups like the LGBTQ and disability communities. LGBTQ people and people with disabilities are disproportionately impacted by homelessness. 40% of homeless youth identify as LGBTQ, and 40% of people with disabilities are homeless. LGBTQ people and people with disabilities often become homeless because of skyrocketing rent, unsupportive families who have kicked them out of the family home, and discrimination from landlords—among many other reasons. Some cities are getting better at addressing LGBTQ youth homelessness by funding LGBTQ housing programs, and some people with disabilities may qualify for housing assistance through Housing and Urban Development. However, with all this progress, the housing system still needs a lot of work as many people still experience significant gaps. Some of these gaps are the result of age restrictions, confusing bureaucracy, and long waiting lists. I was one of those people who experienced gaps in the Washington, DC and Birmingham, Alabama housing systems. I am an autistic transgender man, and my parents kicked me out of the house in late September 2016. While I was in Birmingham, I tried accessing housing services with a local LGBTQ nonprofit, but their services were only for young adults up to age 24 (I was 26). Because I have an amazing support system, I was able to move to Washington, DC. 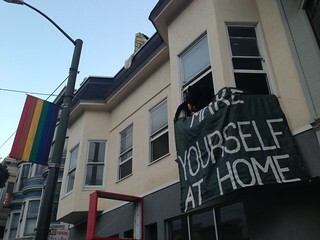 But there I experienced similar difficulties with the LGBTQ housing system, because I was too old. I was able to piece together four months' worth of housing with friends, though, as an autistic person doing so was exhausting and draining. During those four months, I stayed in nine different friends' apartments and houses, crashed on couches in living rooms and, when I was lucky, in private guest rooms. Then I was able to move into the spare room of an older couple, where I was able to stay for another full four months. I was very uncomfortable going to traditional homeless shelters in both Birmingham and DC because, despite identifying as a binary trans man, such shelters are often gendered in the binary: If I were to go to a women’s shelter, I might be safer from assault, but I would get misgendered. If I were to go to a men’s shelter, it would be a little more affirming of my gender identity, but I would be vulnerable to assault. I attempted to get help navigating the government safety net from local nonprofits in DC, such as SNAP, SSI, and housing programs, but they often had prerequisites to receive their full services. One local LGBTQ-affirming nonprofit, Whitman-Walker, required that I become a medical patient with them in order to receive their benefits navigation services. In order to become a medical patient, I needed health insurance. They were able to help me apply for Medicaid, but I still had to wait a month for a new patient appointment. To make matters more difficult for me, their benefits navigation department was walk-in only—and being autistic, I have a hard time going places without a scheduled time. I was also uneasy about handling the uncertainty of not knowing how long I would have to wait to see a benefits navigation staff member. Waiting around for undetermined amounts of time, regardless of length, gives me a lot of anxiety and can be overwhelming. But I was fearful to go elsewhere in DC because I was scared of being misgendered, and I was drained enough from trying to get help that I had little energy left to self-advocate with regards to my gender identity. I have been able to stay relatively safe and housed because of my truly amazing support system, but I can only imagine how much more difficult a situation like mine can be, for people who don’t have the support system I have. It angers me when I hear elected officials talking about how it’s "too easy" to get government benefits, and then propose policies to make accessing benefits harder. We, as a community, need to challenge ourselves to do better, and for our elected officials to do better.